Asset Intelligence is a feature in Configuration Manager that allows to identify and manage the inventoried software of your environment. It’s populated by the hardware inventory scan on each client. The catalog contains data about inventoried software and 5 labels can be defined to standardize product name or any useful information in your catalog. Software’s developers are not always following a standard name for their own products. Consequently, the data quality for software reports will be better. In this post, we will show how you can maximize the use of custom labels in Asset Intelligence. We will use Office Visio as an example for this post. If Asset Intelligence is not enabled in your infrastructure, you can enabled the component by following Technet post. All inventoried software on devices will be listed at that location. On the left side, it’s the information from original software source from the device and on the right side, the custom labels. There’s 2 labels that are configured by default named Category and Family. We don’t see any advantage of using them as is. Don’t worry if they are helpful in your organization, we still have 3 additional custom labels that we can use but will not be covered in this post. We will use 2 default and 3 custom labels. In some situation, Type will not be automatically used like Adobe Photoshop CS6. Follow the below steps to customize Office Visio in Asset Intelligence. Repeat for each label that need to be created. You can verify your new label by clicking on Catalog under Asset Intelligence. 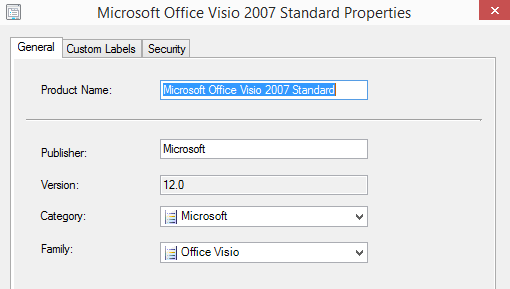 Once you complete, it will be the time to tag all Office Visio products. Do this exercise with all Office Visio products present in the catalog. If you change more than one product at the same time, please refresh the list to obtain new modification. 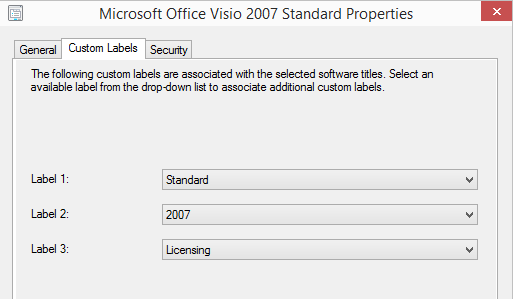 Once everything is finished for Visio products, sort the list by Label 3 and you should see something like this. As you can see, it is a clearest result and it’s easier to standardize your products. You can use the same structure for every products. There’s an operational cost attached with the usage of Asset Intelligence to maintain new entries but it’s definitely worth it. In the next blog post, we will show you how to create reports based on custom labels. Would i be able to use the same process for Operating systems? if so what would you suggest for the Category, Family, Label 1, Label 2 and Label 3 so that one can distinguish between server and workstation as well. One of our clients would like to know. It’s fantastic to see such a useful post. I was searching for the same form some time ago and found a great service with a huge forms library. Just look at the service code>http://goo.gl/7SF1uG. Its pretty easy to use. I think you can get a free trial if you ask for it. Thank you for the “How to maximize the use of Asset Intelligence with Labels” post. 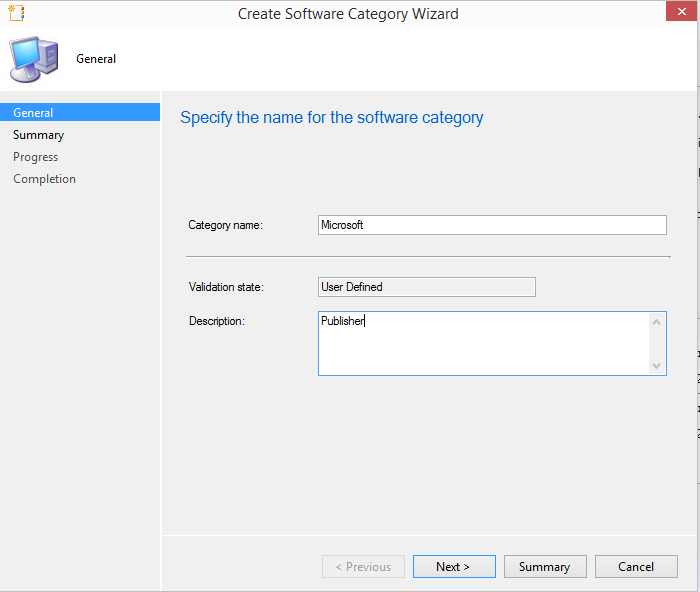 My SCCM 2012 is setup for labels. I am looking forward to your post on creating reports with custom labels. I am trying to create a software inventory report that shows all software installed in add/remove with no label, unapproved label or not known label. You can refer to this Installed Software Report mostly from Add Remove Program. I’ll let you know when the post is ready. We publish the blog post where you will be able to create a custom report based on your labels.